News and community events which impact Washington DC. Admission is free -- but optional hourly timed passes will be available; you can get them online or by phone. Want passes for opening weekend (9/24-9/25)? You'll have to get them in advance. Same-day timed passes won't be available until 9/26. Try avoiding the Metro stations nearest to the museum; Archives, Gallery Place & Metro Center are nearly as close & may not be as crowded. 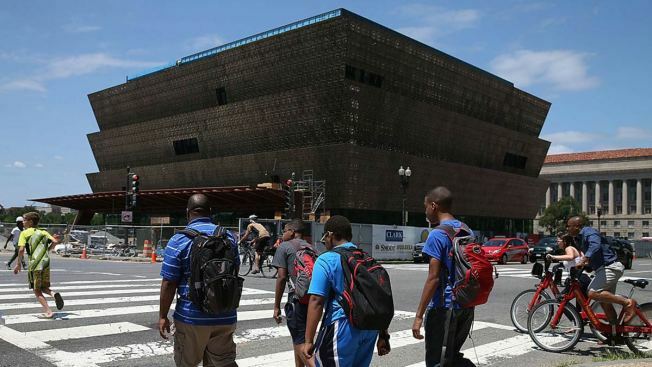 The opening of the Smithsonian's new National Museum of African American History and Culture is one of the most buzzed-about events in D.C. this year -- but if you've got your heart set on going during the first few busy months, be prepared for crowds. 1. The museum will offer extended visiting hours the week after opening. On opening day, Saturday, Sept. 24, the museum will be open for just seven hours, from 1 to 8 p.m. But on Sunday, Sept. 25, it will be open from 7 a.m. to midnight. Extended hours will continue Monday, Sept. 26 through Friday, Sept. 30, when the museum will be open from 10 a.m. to 7:30 p.m. It will be open Saturday, Oct. 1 from 10 a.m. to midnight, and Sunday, Oct. 2 from 10 a.m. to 10 p.m.
2. After opening week, regular hours will be from 10 a.m. to 5:30 p.m. After opening weekend, try visiting on a weekday if possible. 3. Admission is free -- but you must have a timed pass, and they're no longer available for September or October. All advance tickets for the first two months were snapped up in just two days. get passes for November and December instead (find them online here). try to score same-day tickets, which will be available starting Monday, Sept. 26 (after opening weekend). The museum is hoping the passes will help ease extended wait times. When passes are available, you can get them on the museum's website or via a call center (800-514-3849; Mondays through Saturdays 9 a.m. to 8 p.m.; Sundays, noon to 8 p.m.). The passes will have 15-minute entry windows; each will have has a unique code so it can only be used once, the museum's website says. There's no limit on the length of a visit, but officials are warning that it would be tough to see the entire museum in one trip. 4. Familiarize yourself with the museum's offerings ahead of time so when you get inside, you can make sure to see what's most important to you. You really won't be able to see everything in one visit -- the Smithsonian says there are 85,000 square feet of exhibition space, nearly 3,000 objects, 12 exhibitions and more on five floors. Learn about the building here, and see items from the permanent collection here. You can also take a mobile tour, whether you're in the museum or not, by texting the word "lens" to 56512. 5. Don't miss the special opening weekend events! Friday, Sept. 23, noon-5 p.m.
Saturday, Sept. 24, noon-5 p.m. and 6-9 p.m.
Sunday, Sept. 25, noon-5 p.m. and 6-9 p.m.
Headliners will include The Roots and Public Enemy; see more here. 6. Try avoiding the Metro stations nearest to the museum (which is located at 1400 Constitution Ave. NW). The Smithsonian and Federal Triangle stops will likely be very crowded. 7. If you'd like to skip Metrorail, consider the Circulator bus, which has a route along the National Mall and will be adding extra service during opening weekend, or try Capital Bikeshare. Find more details here. 8. To get through possible security screenings more quickly, don't bring large day-packs, backpacks or luggage to the museum or its events.